Artemio "Temo" Muniz is dedicated to securing the future of Texas by working in the Republican Party, building a bridge between Texans of Latino descent and the Republican Party. Temo's work includes founding the now defunct "Conservador Alliance" and volunteering as the state chair for the Latino National Republican Coalition of Texas. His contribution to the Republican Party in its efforts to grow its base within the Latino community was highlighted nationally in the Weekly Standard. He has worked with various candidates at the Houston level, and travels throughout the state attempting to build a strong political network for the future and win the hearts and minds of various leaders for the cause of real conservatism and Republican principles in action. "Strategy, patience, and understanding that our love for conservative principles comes from, within the duty of eternal vigilance, means daily making the appeal to our neighbor that money in their pocket is better than in the government's pocket." 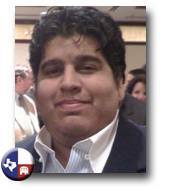 Artemio Muniz also blogs on TexasGOPVote.com. Join the Latino National Republican Coalition of Texas on Facebook.